General Andrew Jackson was an extremely influential participant in the removal of Native Americans from their lands in the Southeast to Oklahoma. From the Grolier Online website. Another life of Jackson dealing mostly with the War of 1812 and his Presidency, from the White House website..
Jackson's case for Indian removal in his first message to Congress, from Vincent Ferraro's website..
Jackson's message to the Creeks (primarily) when he took office as President. Use control-f and search for friends. Followed by a copy of the Chief Speckled Snake's response (following) also. From Fort Benning, The Land and the People"
Chief Speckled Snake's response (Creek?) to Jackson's message. Davy Crockett's opposition to Jackson's policies for removal of the Southeastern Indians from their lands. Use control-f and search for david. 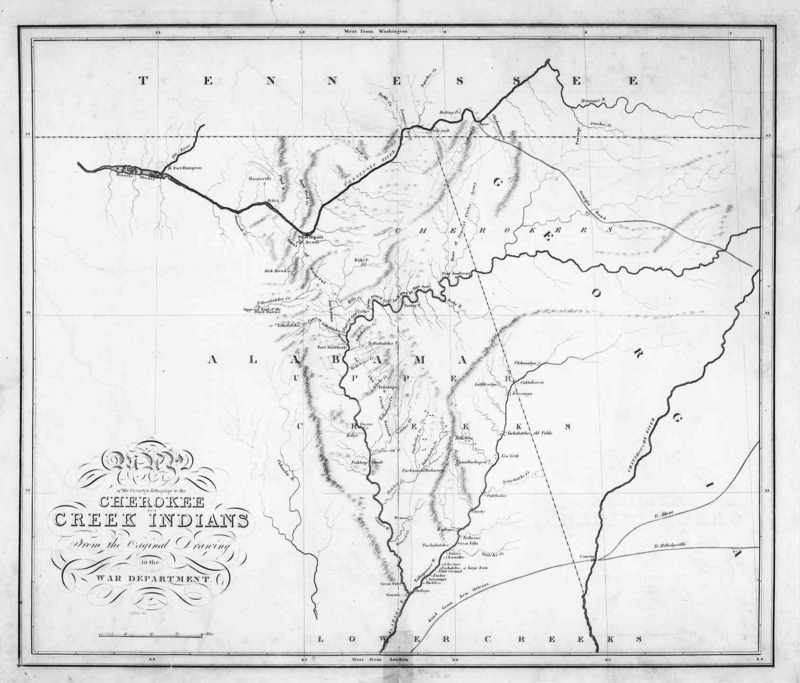 CHIEF WILLIAM McINTOSH McIntosh was instrumental in signing away Georgia Creek lands, resulting in Georgia Creeks coming to live among the upper Creeks of Alabama. He led Jackson's Indian troups at Horseshoe Bend, earned the enmity of Alabama's Upper Creeks, and was eventually assasinated. Memories of his many dealings with the Creeks in the late 1700s and early 1800s in Georgia and Alabama. Woodward fought under Jackson at Horseshoe Bend and later founded Tuskegee in 1833, possibly named for nearby tribe of Taskigi. He owned the land where stood the Council Tree at Tuckabatchie and is said to to have given a discount on the rent of the tenant who complained that it shaded his crop. From Diane Taylor's "Cowan Webpage". An account of the events leading to the battle, and a glimpse of Andrew Jackson, Davy Crockett and William Weatherford. (or possibly having such), with GNIS data and Tiger mapping provided, for Elmore Co. AL and all adjacent counties. The GNIS table has 101 items, with Elmore having almost twice as many as any other county and almost 40% of the total. Locations or features, by county: Elmore 38, Tallapoosa 20, Macon 20, Coosa 14, Chilton 4, Montgomery 3, and Autauga 2. Tallapoosa river area (33k) includes a portion of Tallapoosa Co. and some Indian sites now beneath Lake Martin. Native American land cessions in Georgia from the N. Georgia Native Americans site. 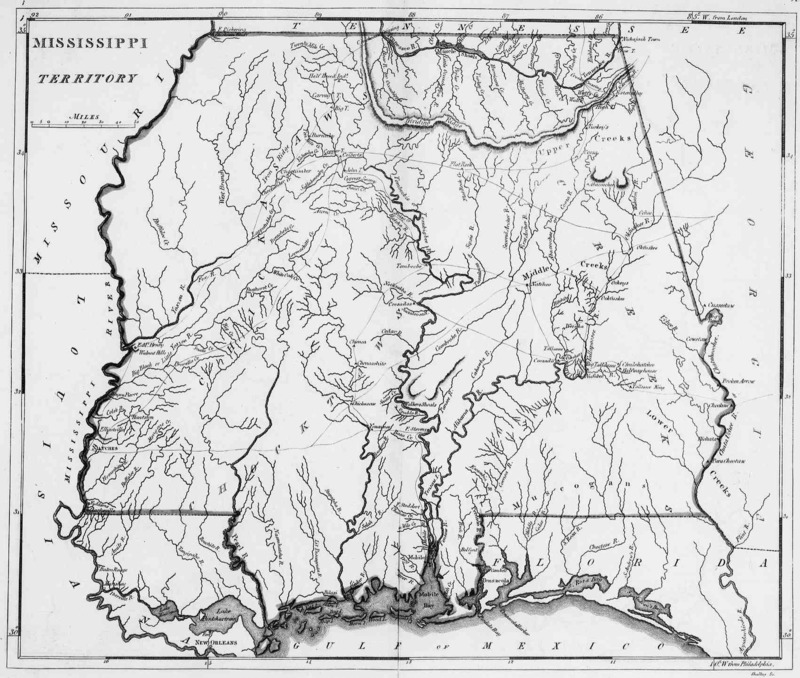 1814 Map of Mississippi Territory [259k] The area of present-day Elmore County AL may be seen at 86 W. and 32N to 33N (right side of the map). The course of the Tallapoosa (named) is similar to that of modern maps.